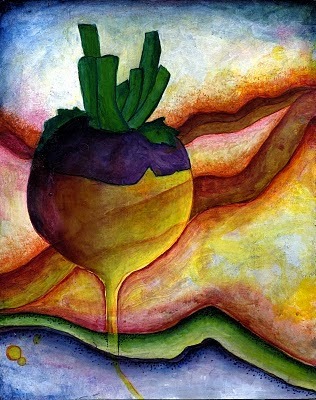 Rutabaga painting by Jaimie Wolf. It is November, and about to rain. I decide to make beef stew for dinner as I hold a giant rutabaga. For many years, calamities have befallen the rutabaga crop at Simple Gifts Farm. An apprentice accidentally plowed them into the ground one season. Another year they were infested with root maggots. The following season we covered them with row cover to keep out the flies which lay root maggot eggs, and the plants rotted in the humidity under there. But this year, there are bins of enormous, bulbous, purple-yellow rutabagas at the farm. For these, my favorite of all root vegetables. I am grateful. They are a simple gift, but the simplicity is deepened with a counterpoint of complexity. A farm plunges us into the complexity of gratitude. To plant our hopes and livelihoods in this particular place gives us – gives us – so much to lose. To have so much to lose is a gift. As we plant and tend and harvest with love, loss and abundance intertwine. Gratitude is not turning one’s back on what is terrifying or what we have lost. It is pausing in the perfect stillness in the world, to be sure, and it is also the tenderness toward what we care about enough to be afraid. And sometimes it is the abundance that is overwhelming. While immersed in life’s waterfall of obligations – even when it is what we love – it is sometimes hard to breathe. Farmer Jeremy, my husband, is coming home today from California, from a board meeting of the Organic Farming Research Foundation, from another loving task he does to engage with the world. I am making beef stew for dinner, and proofreading a beautiful book, and wrestling with the compost bins, and parenting my large and hilarious children. It is all so much. The refrigerator is overwhelmed, too. The vegetable drawer is completely inadequate for the bags of greens and burly vegetables that march in from the farm. They spill into the cheese drawer, crowd out the pot of leftover rice, push the quart of maraschino cherries to the back (yes, even organic farmers have their little red-dye-number-five secrets, which are quite tasty in manhattans). Yet I take a deep breath and plunge in to find the potatoes, the carrots, the onions, the celeriac, and the parsnips. Parsnips always make me think of Farmer Dave. They are a favorite of his, and I think of how his eyes gleam with joy and a dash of mischief as he describes how goodthey are grilled, or roasted. It is a complex joy to share this farm with all of you. Running a CSA is a far more personal, more complicated way to run a farm than wholesaling the goods we produce. But it is because of that complex web of connections that we are so overwhelmingly grateful to you. We hope you feel that nourishment of gratitude, as you nourish us with your presence and your stake in the farm. The main season at the farm is coming to its pause. Most fields wear a green blanket of cover crops. Yet – we keep at our work all year. The hoophouses are full of greens, some just planted. The fallen leaves of this summer’s abundance steam their way to compost that will build this farm’s soil. The walk-in cooler is stacked with carrots, potatoes, and parsnips, and rutabaga. We look forward to sharing our gratitude through the winter season ahead. I appreciate this view of gratitude. Thank you!